Solicitor and co-founder of transcription services provider DictateNow, Maxine Park recently explained to the readers of Credit Control Journal Asset & Risk Review, the importance of recording sensitive meetings and interviews. One of the world’s leading academic research journals dedicated to the advancement of asset risk management, credit analysis and corporate and consumer risk. The journal provides subscribers with practical illustrations as well as theoretical analysis and empirical studies on the development of credit risk, asset management, legal issues, accountancy and finance, and IT solutions. 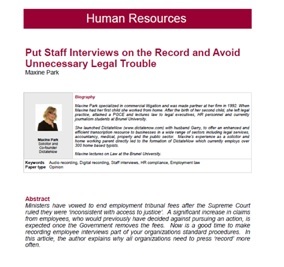 Maxine’s article highlights how handling sensitive meetings and interviews badly can result in serious legal action being brought against your company, and how recording proceedings from start to finish can protect you against any such claims. The article can be found in Volume 39 of the journal, starting on page 15. The Supreme Court recently ruled that employment tribunal fees were obstructing the public’s access to justice, and advised that they should be overturned. Once the fees have officially been lifted, the number of employment tribunals is expected to increase, as proceedings no longer financially deter those making a claim. Once these changes have been made, there will be no stopping individuals from seeking legal action against your company if they feel they have been unfairly treated, so it is important to adopt protective measures such as recording interviews and meetings. Those companies who do not follow set procedures risk landing themselves in hot water later down the line, opening your business up to claims of unfair dismissal or discrimination, with no official record to prove otherwise. Such issues can be easily avoided by simply adhering to the policies in place – this is why companies are increasingly relying upon recordings to help protect their organisation, as well as the employee or candidate being interviewed. It is always best practice to remind parties that an interview or meeting is being recorded, as this allows everyone to fully engage with the discussion, safe in the knowledge that they can get a copy of the recording after the meeting. Knowing a meeting is being recorded can help keep emotions and feelings in check, protecting both parties from being on the receiving end of an unpleasant rant. Sound recordings also help protect organisations from the common accusation that a senior member of staff failed to keep an open mind during proceedings. Not only does a recording capture the exact words spoken, but it also shows the tone of voice of individuals, which can be equally as important when deciding if someone was acting appropriately during the discussions. And remember, the recording doesn’t miss words because it gets involved in an exchange of views too rapid to write down – it is always 100% accurate. Having an accurate recording of interviews and meetings also eliminates the need for multiple rounds of checks and amendments, which can help speed up transcription turnaround, post-meeting. It is important that businesses do not view disciplinary meetings negatively, as they can actually be extremely useful when trying to diffuse a situation amicably.